What You'll Need: scriptures, a bowl of small items of different colored candies with enough of each color so each child will have a choice of several colors, GAK 227: Jesus Praying in Gethsemane, printed CTR chart, printed activity and coloring tools. Scripture: Doctrine & Covenants 37:4 - Behold, here is wisdom, and let every man choose for himself until I come. Even so. Amen. Making choices is a very important part of life on earth. Some choices are easy and some choices are hard. Our right to choose was given to us when we lived in heaven with Heavenly Father and Jesus Christ. Before we came to earth, Heavenly Father called us to a meeting. At this meeting Heavenly Father presented a plan to help us become like him. We chose to follow the plan, so we each came to earth and received a physical body. If we choose to keep the commandments while we are on the earth, we will be able to live with Heavenly Father again. Jesus Christ offered to come to earth to show us what we must do to live with Heavenly Father again. Lucifer wanted to come to earth and force everyone to keep the commandments. He did not want to give people any choices. But Jesus wanted to follow Heavenly Father’s plan. He wanted people to be able to choose how they would live. Heavenly Father knew it would be best for us to choose for ourselves so we could learn to make right choices. Being able to choose for ourselves is called agency. 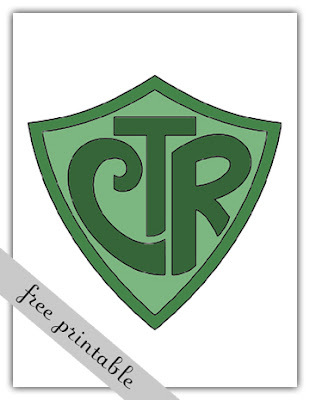 - What do the letters CTR stand for? When we choose the right we will always receive blessings, we can have the Holy Ghost with us and we feel happy. When we make choices we know are wrong we feel bad and sometimes our bad choices lead to other bad things following. Choosing the right is always the best way to be happy, safe and confident. I wake up early to start my day with so many things to do. I put on my clothes and brush my hair, like my mommy asked me to. I help my daddy with outside chores as I rake leaves in the yard. I play with my sister all afternoon, even though sharing is sometimes hard. As nighttime comes, it’s time for bed. Daddy reads stories I enjoy. Mommy gently kisses the top of my head and tells me I’ve been a good boy. I peek out my window to see the moon and whisper a quiet good night. As I say a prayer, I’m thankful this day I remembered to choose the right. Bear your testimony about how grateful you are that Heavenly Father has given us agency. Express your confidence in the children’s ability to make right choices. Thanks for the lesson! We did the Feelings lesson last week and my kids (3 and 2) loved the faces! They have played with them all week! Thank you SO much for these lessons. We have been using them for months and having something ready to go has helped our family do FHE consistently for quite a while now. I don't know what I would do without them! thanks so much for the lesson!! love the coloring page. What a great blog!Thank you for saving me when I needed an idea for FHE tonight! Thank you so much for the wonderful lesson! I wasn't quite sure what the lesson was going to be on tonight and you sure helped me a lot! What a great blog! Thanks! We did the lesson on choices last night. We substituted an assortment of doughnuts for the candy. My kids thought it was the best FHE ever! Ha ha. I also really liked the choices worksheet. I was surprised when the kids (3, 2) actually knew which choice was right! That just tells me I need to hold them a little more accountable for their bad choices because they DO (even at such a young age) know how to choose the right! Thanks again! Printed the choices coloring page. Had to laught at the kid with big bald patches all over. For our family this is definitely a lesson within a lesson. My 4 y/o is ever so slightly psycho-scissor-happy!!! LOVE your site. I actually look forward to FHE now! Thank you for your time and effort! This one makes me cry. The topic is really relevant to my oldest son right now. I'm looking forward to doing this lesson to see what the Spirit teaches us. Thank you for this! We are using part of it for my daughter's primary talk today (that I didn't know she had)! thank you, thank you! you save me weekly. i appreciate all you do!! Thank you for making it so easy to do FHE! This is a great lesson for young children! Thank you! I just recently found your site and love it. You have put forth a lot of work. Thank you for sharing! Thank you so much! I was looking for "choice" pictures for a FHE and found your blog. I made a V on the floor with tape and had the 4 toddlers in my house start at the bottom of the V and walk as far as they could with one food on each side of the V. Eventually they had to choose a side- we talked about choosing the right and then put the choice pictures at the top of the V and had the toddlers choose the right choice... we used your scripture and song from this lesson as well.... this was the perfect simple yet meaningful FHE for our toddlers. Just wanted to say thank you for sharing this. I am going to add your activities and ideas to my primary lesson tomorrow. I can't tell you how helpful it is to find some free printables. Love your site! 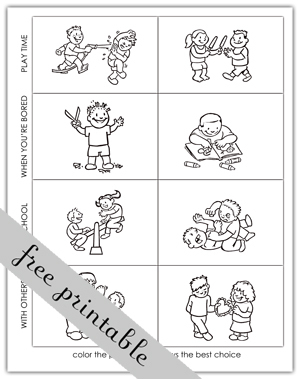 I like that the lessons are clear and simple (and the free printables are great!!) Thank you!